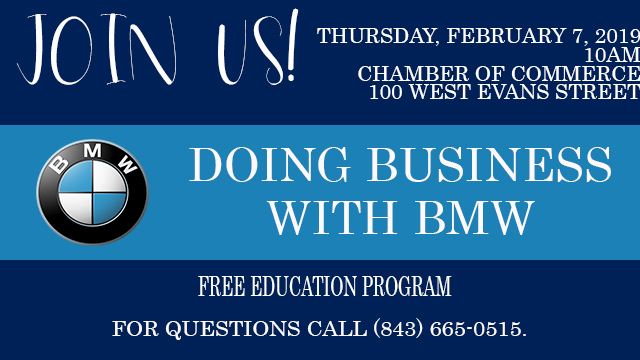 FLORENCE, S.C. – The Greater Florence Chamber of Commerce in partnership with BMW is hosting a one-hour “Doing Business with BMW” forum at 10 a.m. on Feb. 7 in the chamber office at 100 West Evans St. Representatives from BMW will discuss upcoming opportunities for small-, veteran-, woman- and minority-owned businesses, as well as details on attending the BMW supplier diversity conference in Greenville on April 4. “The Florence Chamber sends a group of local, small minority businesses to the BMW Conference every year, which started while building a rapport with BMW several years ago” said Les Echols, the chamber’s director of community and minority enterprise. The Carolinas-Virginia Minority Supplier Development Council (CVMSDC) will also be on hand to discuss how it supports and promotes minority-business development. The forum and partnerships are a part the PRISM program, a chamber initiative that was created to promote the inclusion of small and minority businesses. 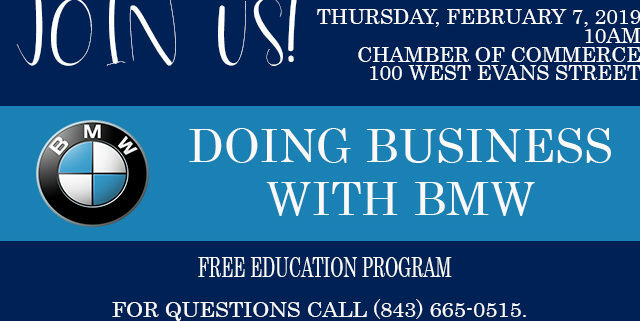 Attendance for the “Doing Business with BMW” is free, but advance registration is required since seating is limited. Those interested in attending should RSVP at this link.